In 1983 I went to a four day training seminar in Germany on the use of ozone in medicine. One of the things that I learned was that ozone was very effective when injected into rheumatic joints. Inflammation decreased, swelling decreased, and most importantly pain decreased. How and why all this was happening was not explained, but the procedure had been done for years, and several clinical studies had verified the effect. As so often happens after we learn something, shortly after the seminar I had a patient with rheumatoid arthritis show up at the clinic with severe inflammation and pain in both of her knees. After explaining to her what I had learned, she consented, and I injected both of her knees with ozone gas. The result was dramatic. Within two days 75% of the pain and inflammation was gone. But this case is only the beginning of the story. The following week a neighbor of this patient came to the clinic asking to have her right knee injected with “the same thing you gave Mary.” Only this patient did not have an inflammatory condition. She had an osteoarthritic knee that she had been suffering with for several years. I explained to her that treating an inflamed joint was very much different from treating a degenerated joint, and although Mary had a good result, I did not know if the treatment would be helpful in her particular case. I told her that as far as I knew, no one had reported any success in treating degenerative conditions with ozone. Then she asked, “Well will it make me any worse? I can hardly walk as it is. They already want me to have a total knee replacement. What harm could it do to try?” I had to admit that she had a good point, so I consented to the proposal. She called me up one week later and told me that she was 20% better, and would I please give her another injection. We continued the treatments for a total of seven times, at which point she was so functional that she saw no need for further treatments. She remained that way for months, and only needed to return 2-3 times each year for a “booster.” Soon, she told several other people about her success, and I began using the treatment on a host of other patients. One of those patients, after her third injection, asked me a question. “Doctor, these injections really hurt a lot. Why don’t you use any Novacaine?” It’s true. When ozone is injected into tissue, especially in the higher concentrations that I was using at the time, it causes intense pain for the first few minutes while it is exerting its oxidizing effects. After 3-4 minutes, the pain is almost completely gone, but those first few minutes can be rough. In addition to its pain blocking effects, as any student of neural therapy knows, procaine (the generic form of Novacaine) also stabilizes and restores damaged membrane potentials. This effect often results in curing chronic pain with nothing more than simply injecting procaine into the damaged area. For both of these reasons, the next time I injected this patient I pre-injected the knee with buffered procaine. The result was just as good as what I had been seeing when using only ozone, perhaps even better, and now I had a much happier patient. I continued to use this combination. Then I thought since I was already pre-injecting the area with procaine, what else might I put into the mix that might make the results even better? I reasoned that ozone was exerting its healing effect through the process of improving oxygen utilization, so I added various nutrients that play important roles in the utilization of oxygen. This included magnesium, niacin, methycobalamin, folic acid, and pyridoxine. I also experimented with using sea salts. Soon, I discovered a combination of ingredients that was easy to administer, inexpensive, and definitely improved my results. But I was not finished. I also knew that many of the patients I was treating were suffering not only from pain stemming from degeneration, but also pain from inflammation. The two were often combined. This became very obvious to me after treating several cases in which the patients had been previously treated with injectable corticosteroids. The previous use of steroids not only did not interfere with ozone therapy, in some cases it actually seemed to help the process along. So I made a homeopathic dilution of methylprednisolone, and began adding it to the pre-injection mixture. To this I also added an anti-inflammatory homeopathic combination called Traumeel™. My results continued to improve. But something else also occurred to me. All along, I had been wondering if these injections of ozone weren’t simply another version of Prolotherapy. After all, ozone is an irritating substance, and it hurt. Perhaps it was working in the same way that a proliferative solution worked. But proliferative solutions require inflammation in order to be effective, and I was now discovering that ozone injections worked even in the face of anti-inflammation therapy. So just to further check this out, I started using allopathic doses of methylprednisolone in the pre-injection. I also experimented with using oral prednisone in combination with the ozone treatments. What I discovered was that the effects of ozone therapy, unlike those from proliferative agents, was not interfered with by anti-inflammatory medications. Indeed, they seemed to be synergistic. This simple observation caused me to theorize that ozone therapy was working along a principle that was different from the way that Prolotherapy works. I will explain what I think this principle is in the next section. But if that is the case, if they are both working from two different principles, might it not be reasonable to expect that there may be some synergistic effect from combining ozone with Prolotherapy? So that’s what I did. I developed a protocol wherein when I initially began treating a patient I used an anti-inflammatory mixture for the first 2-3 times. Then, when inflammation was no longer part of the clinical picture, I started adding in various proliferative agents. The one that I have the best results with is sodium morrhuate. Both the initial trauma and the ensuing edema and inflammation result in a decrease in circulation. This compromises the delivery of oxygen and important nutrients to the localized area of damage, and decreases oxygen utilization even more. The trauma also compromises cell membrane potential, which both causes decreased oxygen utilization, and in turn is caused by decreased oxygen utilization. So, even though stem cells and blast cells are there, and growth factors are being released, healing does not occur. None of these mechanisms can be effective because of a lack of adequate oxygen utilization. Thus, a vicious cycle, which I dub “The Circle of Chronic Pain” results: decreased oxygen utilization leads to a decrease in cell membrane potential and an increase in free radical damage, which leads to tissue damage and increased inflammation and edema, which perpetuates the trauma, which leads to a further decrease in oxygen utilization. All of which adds up to chronic pain and degeneration. Break that cycle, and the cells and tissues can begin to do what they usually do so well—heal themselves. That is precisely what Prolozone does. 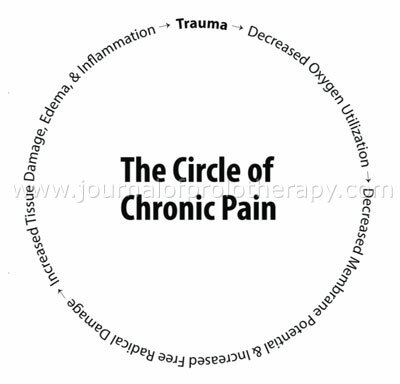 The circle of chronic pain. Prolozone heals this cycle of chronic pain, allowing the cells and tissue to regenerate and heal. Each component of Prolozone has a specific biological purpose. Procaine acts to re-establish cellular membrane potentials. Anti-inflammatory agents decrease edema and swelling. The inclusion of vitamins and minerals provides necessary substrates for oxygen utilization that in damaged tissues are often deficient. And finally, oxygen utilization is directly stimulated by ozone. How does ozone stimulate oxygen utilization? The answer to this question is beyond the scope of this article, but is answered in my book, The Principles and Applications of Ozone Therapy – A Practical Guideline For Physicians, which can be purchased from Amazon.com. The short answer is that is does it by oxidizing NADH to NAD. As oxygen utilization decreases, in this case from trauma, the ratio of NAD to NADH decreases. A decrease in the cells’ NAD/NADH ratio results in a slowdown of all cellular function including protein synthesis, cellular division, growth factor function, membrane potential maintenance, etc. As previously mentioned, ozone reacts with the double bonds in lipids and amino acids and creates peroxides that are able to oxidize NADH to NAD, and thereby correct the declining NAD/NADH ratio. And by doing this, cellular function is stimulated to return to business as usual, and oxygen utilization is returned to normal. The net result is that the tissues get what they need to heal—energy. And as they heal, the circulation to the area is re-established, pain is cured, and the treatment is complete. As a powerful oxidizing agent, ozone also has several other effects that are important for tissue repair and regeneration. One is by stimulating growth factor production and release. One paper published in 1996 examined the critical role that protein tyrosine phosphorylation events play in proliferation and differentiation. The authors determined that oxidizing agents “stimulate growth response events in vascular smooth muscle cells,” and also “stimulate tyrosine phosphorylation of several proteins including epidermal growth factor receptor.” The stimulation of growth factors, especially endothelial factors are important for tissue regeneration to occur. But ozone therapy can do more than just stimulate growth factor production and release. It also activates the membrane receptors through which growth factors exert their effects. For example, a paper published in the Journal of Biological Chemistry established a novel role for the mitochondrion as a proximal target specific to oxidant induced signaling and growth factor transactivation. And finally, there is evidence that ozone therapy can mediate the effects of the various growth factors. A recent 2005 paper entitled, “NAD(P)H Oxidase 4 Mediates Transforming Growth Factor-ß1–Induced Differentiation of Cardiac Fibroblasts Into Myofibroblasts,” describes how oxidized nicotinamide adenine dinucleotide (NAD) induces circulating fibroblasts into repairing damaged cardiac tissue. NAD activity is enhanced by ozone therapy because it increases the NAD/NADH ratio. The first thing that most patients notice after a Prolozone treatment is an almost immediate 50-80% decrease in pain. This is in part due to the effect of the procaine. But ozone itself has a significant ability to directly relieve pain. A 2009 article published in the European Journal of Pharmacology demonstrated that a single subcutaneous injection of ozone prevents allodynia and decreases the over-expression of pro-inflammatory caspases in the orbito-frontal cortex of neuropathic mice, immediately eliminating any signs of pain. Lamberto Re, a medical doctor and soccer team physician in Verona, Italy routinely injects the acutely injured areas of his players with ozone alone. He does not use procaine. And he reports a marked decrease in pain as well as an improved rate of healing. Next, chronic areas of degeneration such as in osteoarthritic knees, hips, and ankles will regenerate. Although more research is needed to fully document this effect, some physicians have already taken pre and post treatment x-rays that have shown an increase in cartilage thickness in knees treated with Prolozone. And fortunately, other than a rarely occurring and temporary increase in pain in the area injected, no significant side effects from Prolozone have ever been demonstrated. Other than the possibility of an allergy to one of the liquid components, there are no contraindications to its use. Table 1. Conditions that have been found to be very responsive to Prolozone. While clinical trials using the exact technique involved in Prolozone have not been published, there have been several papers published in the international literature lauding the use of ozone injections in various pain syndromes. A list of these articles is provided at the end of this article. I am a big fan of classical Prolotherapy and neural therapy. These are the techniques that I originally learned years ago, and they are very effective. They set the stage for the development of the various Prolozone techniques. However, at this point, simply because Prolozone is so effective, I virtually never use these other modalities as they are classically used. Additionally, Prolozone offers some advantages over classical proliferative therapy. First and foremost, ozone directly stimulates the down regulated oxygen utilization in damaged areas of the body that is at the heart of why these areas don’t heal. Prolotherapy does not have this action. Secondly, Prolotherapy is typically very painful, with the pain from the therapy often persisting for days to weeks after a treatment. In contrast, patients receiving Prolozone feel immediate improvement, with very little or no pain at all during or after the treatments. Prolotherapy requires many injections, whereas Prolozone only requires a few. This means that Prolozone is faster, and typically much less expensive. Because Prolozone involves the injection of a gas in large volumes which expands into a large area of surrounding tissue, it is not as critical to pinpoint each Prolozone injection as it is when using proliferatives. Thus, it is easier to master. Since Prolozone does not work as a proliferative, the use of anti-inflammatory medications is not contraindicated, and can in fact be synergistic. Prolozone is especially effective when used intra-articularly. It can stimulate the regeneration of damaged cartilage in knees, shoulders, ankles, and hips. Mary Anne is a 48 year old master ICU nurse. 10 years prior to her visit she injured her back in a lifting accident. After a year of failed conservative management, she had a lumbar spinal fusion involving the placement of several metal plates. Her pain continued, and was managed with narcotics. Several years later for no apparent reason her neck began to hurt, and she developed right arm neuropathy. Her neck was then fused, and metal plates placed there as well. Shortly after, she was forced to stop nursing. Previous to my seeing her, she had had neural therapy, classical Prolotherapy, acupuncture, and various physical therapy techniques. All of these modalities had failed to offer anything but temporary relief. On her first visit she presented as a woman addicted to narcotics, with chronic and severe pain in her neck, down her right arm, in her lower back, and down both legs. She also was developing increasing weakness in her right hand. She was only able to ambulate into the treatment room with assistance. She was treated with Prolozone injections to her neck and lower back every two weeks for three months. The treatments took about 10 minutes. At this point the weakness in the hand had disappeared, and her pains had diminished to the point that she had cut her medication dose in half. Her treatments were decreased to three week intervals, and after three more months her pain had reduced to a fraction of what it had been, and she was off all medication. This was obviously an extreme case, but she is a great example of what Prolozone can do. Most cases of chronic back or neck pain resolve in 4-6 treatments. This patient went on to have several relapses of her pain, primarily because she had to make frequent flights across the country. It was not until a full year of therapy, with treatments being performed at six week intervals that she became completely functional with minimal pain. It has now been almost one year since her last treatment and she continues to do well. Joe is a 66 year old retired metal worker who presented with bilateral knee pain. His x-rays showed bilateral medial compartment bone on bone. He had been advised by orthopedic surgeons to have bilateral replacements. He was very limited in his activities, could no longer play golf, and walked with a slow, shuffling gait. He took NSAIDs daily. Joe was treated with intra-articular Prolozone every two weeks for three sessions. At that point he was no longer requiring medication, and was able to perform activities that he previously could not do. The treatments were stretched out to every 3 weeks and then every 4 weeks, and ultimately every 6 weeks until he was completely asymptomatic and playing golf again. He had a total of eight treatments. I have seen many cases just like Joe’s. About 85% of the time they have the same kind of result. I have never had a patient go to knee surgery in fifteen years of using Prolozone. Figure 1 is an x-ray of another patient (not Joe) taken in August. Figure 2 was taken the following February after eight Prolozone treatments. I wish I had more x-rays like this, but I don’t routinely take post therapy x-rays. These were done by a colleague trained in the Prolozone technique. Figure 1. 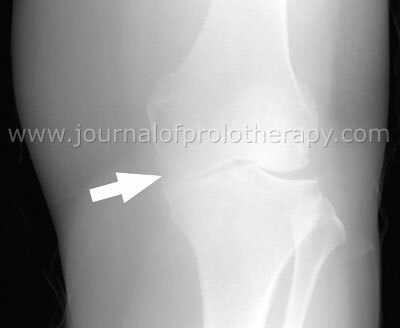 Knee X-ray before Prolozone™ showing severe medial joint space narrowing. Figure 2. 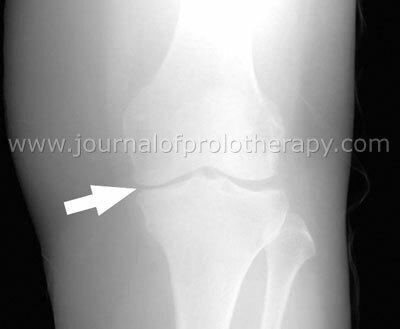 Knee X-ray after Prolozone™ showing increased joint space. Randy’s examination revealed pain on stressing the wrist, and tenderness over the affected area on the dorsum of the wrist. It took me all of five minutes to infiltrate the area with Prolozone. When Randy returned with his wife four weeks later, he happily reported that the pain was completely gone. It has now been 1½ years since that first injection, and he remains asymptomatic. What? A chronic pain that goes away with only one inexpensive five minute treatment? Sounds like an exaggeration. But I have seen this kind of thing happening so often that I am convinced that ozone has properties for alleviating chronic pain which are unique, and still not fully understood. But don’t believe me. Call up any one of the doctors using Prolozone. They will tell you they see the same kind of remarkable results. I have been training doctors in the Prolozone technique for over fifteen years. Of course the ones who learn the fastest are the ones who are already versed in classical Prolotherapy, and/or are used to injecting tissue. Because of their understanding of anatomy, orthopedists, osteopaths, and chiropractors are particularly quick learners. But anyone can do this therapy. It is a very forgiving modality. Remember, it’s like target practice with a shotgun. It’s hard to miss the bull’s eye. This January, 2011, The American Academy of Ozonotherapy (AAO) was formed. The AAO is an academy of health professionals dedicated to establishing standards for the art and science of Ozonotherapy, educating the public and other health professionals about the many uses of Ozonotherapy in medicine, and promoting research in Ozonotherapy. Our goal is to enhance the health and well being of people through this safe, inexpensive, and effective therapy. You can learn more about the AAO at www.aaot.us. For information on Prolozone training and joining the AAO, please contact me at doctor@antiagingmedicine.com. 1 Rao GN. Protein tyrosine phosphorylation events play determinant roles in cellular processes such as proliferation and differentiation. Oncogene. 1996 Aug 15;13(4):713-9. 2 Kai C, et al. Mitochondrial function is required for hydrogen peroxide-induced growth factor receptor transactivation and downstream signaling. J Biol Chem. 279 (33):35079-35086. 3 Ioan C, et al. NAD(P)H oxidase 4 mediates transforming growth factor-ß1–induced differentiation of cardiac fibroblasts into myofibroblasts circulation research. 2005;97:900-907. 4 Bonetti M, et al. Intraforaminal O(2)-O(3) versus periradicular steroidal infiltrations in lower back pain: randomized controlled study. Am J Neuroradiol.2005 May; 26(5):996-1000.CONCLUSION: Oxygen-ozone treatment was highly effective in relieving acute and chronic lower back pain and sciatica. The gas mixture can be administered as a first treatment to replace epidural steroids. 5 Al-Jaziri AA, et al. Painkilling effect of ozone-oxygen injection on spine and joint osteoarthritis. Saudi Med J.2008 Apr;29(4):553-7.CONCLUSION: This study validates the painkilling effect of ozone-oxygen injection on osteoarthritis of the joints and spine. Its long term effect on pain advocates the likelihood of some histological changes as mechanism of its action. 6 Fuccio C, et al. A single subcutaneous injection of ozone prevents allodynia and decreases the over-expression of pro-inflammatory caspases in the orbito-frontal cortex of neuropathic mice. Eur J Pharmacol.2009 Jan 28;603(1-3):42-9.CONCLUSION: These preliminary data show that peripheral neuropathy induced over-expression of pro-inflammatory/pro-apoptotic caspases in the orbito-frontal cortex and that ozone, by mechanisms that are as yet unknown, can regulate the expression of the genes that play a pivotal role in the onset and maintenance of allodynia. 7 Paoloni M, et al. Intramuscular oxygen-ozone therapy in the treatment of acute back pain with lumbar disc herniation-a multicenter, randomized, double-blind, clinical trial of active and simulated lumbar paravertebral injection. Spine.2009;34(13):1337–1344.CONCLUSION: Ozone vs placebo – 61% vs 33% pain free. 8 Bonetti M, et al. Intraforaminal O(2)-O(3) versus periradicular steroidal infiltrations in lower back pain: randomized controlled study. AJNR Am JNeuroradiol. 2005 May;26(5):996-1000.CONCLUSION: Ozone more effective than steroids – 8.6 vs 21.4% poor outcomes. 9 Fifth International Symposium on the Applications of Ozone, April 2007, Havana, Cuba.CONCLUSION: We conclude that intra-articular ozone is an effective therapy in the treatment of grade III knee osteoarthritis resistant to treatment with NSAIDs.“Ozone Shot as Effective as Surgery for Herniated Discs” As reported in CyberRounds, by Neil Wagner online at www.cyberrounds.com.A Toronto team examined the results of 12 previous studies involving over 8,000 patients of ozone treatment of herniated discs. The studies showed ozone therapy to be just as effective as surgery but with a shorter recovery time and a much lower risk of complications. 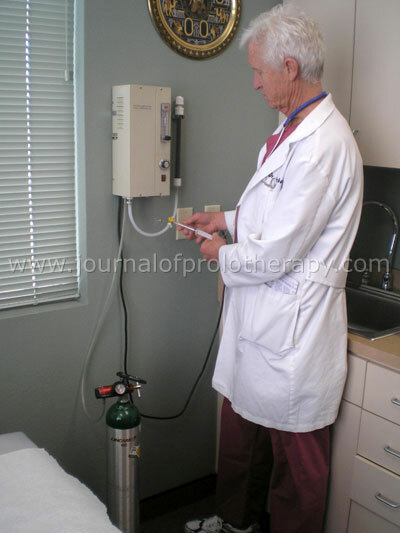 oxygen, ozone, Prolotherapy Research, prolozone, Frank Shallenberger, MD, HMD, ABAAM, Volume 3 : Issue 2 : May 2011, Wonder Why?